I strive to use scientific methods for understanding anthropogenic processes that drive habitat change for biodiversity, and tapping into this knowledge to trigger processes in which society can participate in improving the quality of habitat for the benefit of both nature and humans. My scientific work in Kenya entails research that regards the environment and biodiversity as global natural capital and biological heritage that is fundamentally crucial for long term human survival, development and enjoyment. The cosmopolitan and nature of birds presents a particularly demonstrable inspiration for humans to strive for borderless environmental stewardship. In my ornithological research, I study bird conservation issues revolving around priority species such as endangered species and habitats under anthropogenic pressure; I highlight birds as drivers of ecological service provision, or as agents of human economy, both positively (e.g. in tourism and education) and negatively (e.g. as crop pests or invasives). 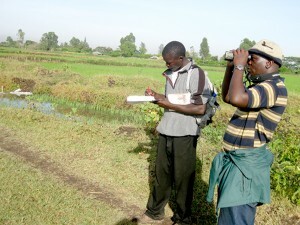 My latest project (2013–2014) involved the economic valuation of crop loss by farmers from damage by flocks of Red-billed Quelea at a rice irrigation scheme in western Kenya, and its implications for rural food security. My other focus is to use biodiversity informatics tools to mobilize and package scientific information or existing biodiversity records into such forms that can be used for either policy formulation or for bottom-up decision support by grass-root stakeholders.